Is Nail Polish Turning Your Nails Yellow? Most women notice that their nails have turned yellow once they apply and remove nail polish. Yellow nails can look really ugly. To cover it up, we generally tend to apply another coat of nail polish without giving it a chance to turn back to white. So, what is the reason behind this? Our nails, though hard, are actually porous (have small pores or holes). Nail polishes have a number of chemicals which are required for smooth application, colour/shades, drying etc. One such compound used in nail polishes called iron oxide, which is primarily used in red, pink and dark shades, is the main cause for yellowing of nails. Iron oxide is basically rust. You would have noticed water turning brown when it comes out of a rusted pipe. 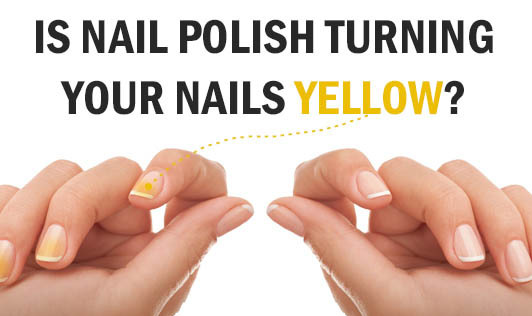 The same way, our nails absorb colour from the paint and turns yellow. However, this discolouration is only on the surface of the nails and does not stain the nail bed or the fingers. Yellowing increases if you apply nail polish soon after using a remover. Nail polish remover makes your nail more porous allowing more colour to be absorbed. • Apply a base coat of plain nail polish before applying dark shades. • Avoid using nail polish soon after using a remover. • If your nails have turned yellow, avoid using nail polish till your nails turn white. • Don't leave dark nail polishes on for too long.